I am, once again, looking forward to visiting Monterey in October. 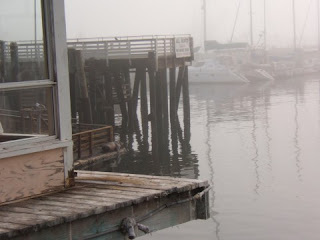 I am hoping for great weather, unlike my first trip to Monterey, when it was cold and foggy the whole time. The fog didn't seem to burn off in Monterey anywhere near the water, but it was sunnier and warmer more inland from the ocean. It was a beautiful day at the Carmel Mission, officially the San Carlos Borromeo de Carmelo Mission, the skies were blue and the temperatures were warmer. 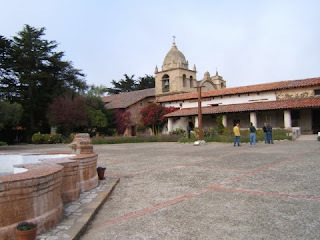 The mission was interesting, but I actually liked Mission San Juan Capistrano in Southern California better. However, I do recommend visiting as it an interesting historical sight and is the final resting place of Father Junipera Serra. From Carmel-by-the Sea you can drive down to Big Sur along the beautiful, rocky Pacific Coast. 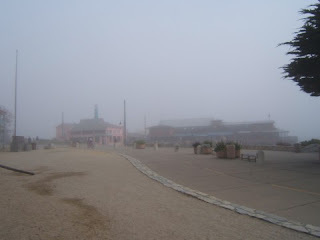 Unfortunately, my one attempt to do this was pre-empted by the fog...you couldn't see a thing, so I gave up. I do plan to go back, weather permitting.